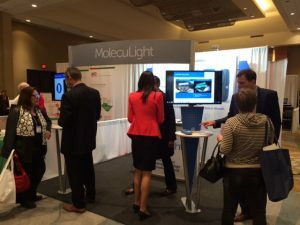 MolecuLight Inc. launched the MolecuLight i:X at the CAWC (Canadian Association of Wound Care) Conference in Toronto, Canada (October 30th-November 1st 2015). Clinicians across Canada attending the CAWC benefited from a close up view of the MolecuLight i:X imaging device during the exhibit sessions. Recently approved by Health Canada, the MolecuLight i:X is intended to be used to detect potentially harmful bacteria in chronic wounds, in real-time at the point-of-care. Dr. Ralph DaCosta (Founder, Chief Scientific Officer and Director) presented data from the latest clinical studies in a presentation entitled ‘Improving bacterial load detection in diabetic foot ulcers with fluorescence-guided imaging’. Furthermore, MolecuLight Inc. celebrated regulatory approval by sponsoring the CAWC Halloween Event.